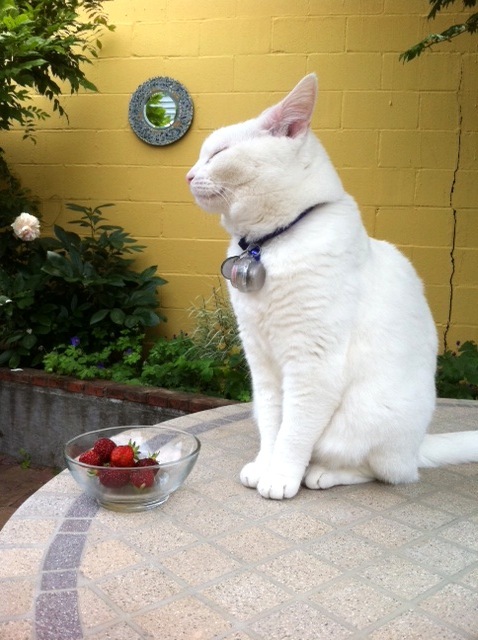 The cat was sitting peacefully on the table, a dish of fresh strawberries by her paws. A minute later, the crash: Glass bowl in pieces on the patio pavers, strawberries among the shards. Cat, still sitting peacefully on the table, now facing me. “So what?” she seemed to ask. As I crawled around under the table, carefully picking up the pieces of glass, I was thinking about the importance of the first line of a story, or the first page of a book. Do you start with the peaceful cat and berries? With the defiant cat among the broken glass and spoiled fruit? Or with the broken bowl and berries, no perpetrator in sight? Yes, it’s the fourth week of the Clarion West Write-a-thon, and every domestic disaster is fodder for fiction. I’m working on the second of my three pledged short stories (which is not about strawberries). Clarion West Board Chair Kelley Eskridge has challenged the 142 people writing to raise funds for the organization to each bring in an additional sponsor, via PayPal or check, this week. Will you become my next sponsor? If you’re local, I’ll bring you the next bowl of strawberries from the garden. Before the cat gets it.